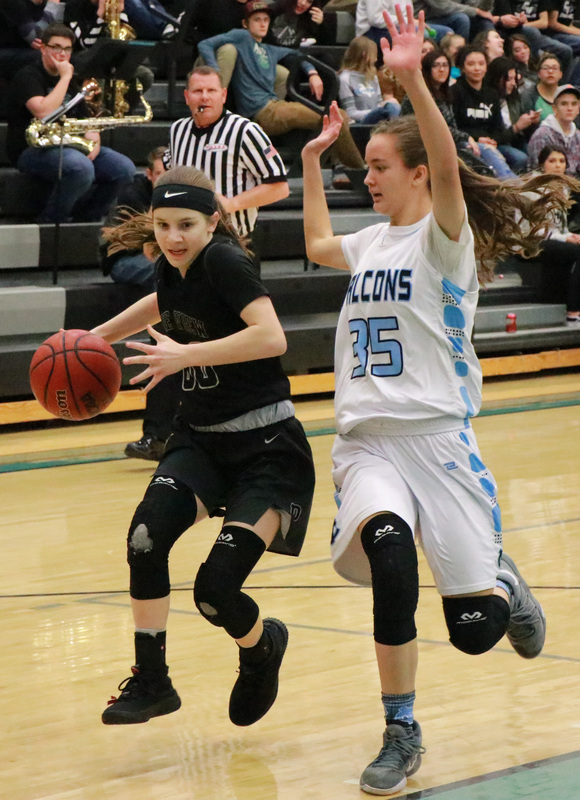 CEDAR CITY — After battling Canyon View to a tie during the first half, the Pine View Lady Panthers pulled away in the second half and coasted to a 59-37 victory Tuesday night. Pine View outscored Canyon View 15-10 in the first period, with senior guard Dawn Mead knocking down a pair of 3-pointers and scoring eight points during the quarter. Canyon View senior Cristal Elias scored seven of the Lady Falcons’ points in the first period, including a pair of 3-pointers. Canyon View then outscored Pine View 13-8 during the second quarter, with Jordan Nielson making two 3-pointers for the Falcons. Nielson was fouled while banking in her second trey and made the ensuing free throw for a four-point play that put Canyon View briefly ahead, 17-15. The score stayed close the rest of the second period, and at halftime, the teams went into the locker rooms deadlocked at 23-all. Pine View head coach Chris Brinagh said he told his team at halftime to play with more intensity. “I told them, we’ve gotta play and we’ve gotta win, or we’re out of the playoffs,” he said. Pine View outscored Canyon View 16-9 during the third period, with senior Claire Newby making seven of the Lady Panthers’ points that quarter. She continued to take the ball inside several more times in the fourth quarter, finishing with a game-high 22 points, 15 of which came in the second half. 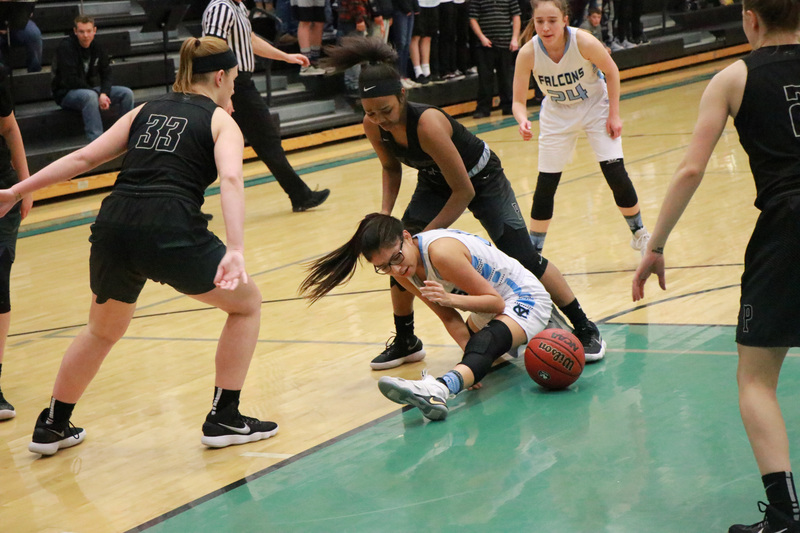 Pine View’s stifling defense held Canyon View to a single field goal during the fourth quarter, the Panthers outscoring the Lady Falcons 20-5 during that stretch. Adding to Newby’s 22 points, Pine View’s Mead scored 13 and Saraven Allen made 10. Canyon View was led by senior Elias, who scored 12 points, and Nielson added nine. Pine View, which has a bye on Thursday, finishes its season with a 7-5 record in Region 9, guaranteeing it a playoff spot. Cedar, which beat Hurricane Tuesday, sewed up the region title, while Hurricane can do no worse than a tie for second. The Lady Reds won at Hurricane in a low-scoring contest, 38-35. Cedar’s victory snapped the Lady Tigers’ seven-game winning streak and assured the Lady Reds of the Region 9 title. Hurricane had a shot to win the game in the closing seconds, but missed the attempt. Cedar’s Dream Weaver rebounded the miss and was fouled. She sank both free throws to account for the final three-point margin. “We had a really good look, but just missed it,” Hurricane coach Franci Homer said. Weaver finished with 24 points, including three 3-pointers. She also pulled down six rebounds and had four assists. The game also marked Cedar senior Carley Davis’ return to action after missing more than a week due to a concussion. Davis finished with four points, three rebounds, two assists, and four steals. Sophomore guard Japrix Weaver added five points for the Lady Reds. Hurricane was led by senior Jayden Langford’s eight points, while Hailey Homer added seven. Madi Hirschi added four points, five rebounds and five steals for the Lady Tigers. Hurricane (now 7-4 in region play) will finish out its regular season at Snow Canyon Thursday. The Tigers can secure the No. 2 playoff spot with a win on Thursday. Meanwhile, region champion Cedar (9-2) will face Dixie (3-8) at Cedar that same evening.